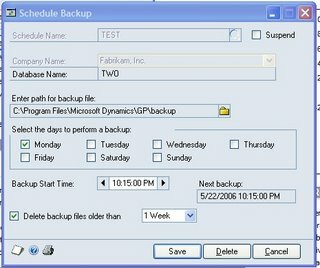 Description: Dynamics GP 9 and 10 allow you to schedule backups from within the application. You'll need to be logged in to GP as an administrator and you'll need to be on the server. Go to File-Backup. Enter the system password if you've set one. The backup window opens, pick Schedule. This process creates a job in the SQL agent with the information entered. You can modify the job through the GP interface or via SQL to set more advanced options (like notifications). No, I don't expect DBA's to be using this, they'll create their own SQL Jobs, but if you don't have a dedicated DBA, this is a good start. You'll still need to move the backups off the server for real protection but that's easier with today's portable hard drives. There's no excuse for not backing up your Dynamics GP installation now.